Find the grey board HERE. I printed mine in black and wish I had done grey...so use the grey one! If you'll notice on my actual poster below, the clip art of the heaven and earth are a bit blurry but the game board seems to be fine. I couldn't find clip art with a high enough resolution to not be blurry. Click on "Photo Gifts" and select "Collage Prints"
Choose the 20x30 collage print for $9.99, "vertical," "lustre" and "Get Started"
Select your photo and "create now"
On the left it says "add title." Type in "I Will Follow God's Plan" and add it to the top. You can also change the font theme. I chose "Garamond"
Add a border if you like - you can determine how thick you want it by clicking the "+" and "-"
If you don't have access to Costco, or it's late Saturday night or early Sunday morning (I wouldn't recommend this lesson plan if that's the case, however! ), you can print my tiled version HERE (grey version only). It will print on 9 sheets of paper. I'd recommend printing it on card stock and laminating it. The colored squares will contain key word pictures where the kids will have to pick the correct one (to begin, have them all hanging randomly next to the poster on the board). Emily on LDS Chorister's page made these fabulous images HERE that I resized to be a little smaller (see her original post on Facebook HERE). I printed them on card stock, cut them out and should laminate but I'm feeling lazy! I've also seen individual die at Zurchers and a reader once mentioned they saw them at Dollar Tree. Before primary, hang the poster on the chalk board using heavy magnets and then hang up the clip art images, randomly and out of order next to the poster and game marker(s) blue painters tape (if you'll be re-using the board as regular tape may rip your poster). To start, tell the children that God has given us a very special gift. Ask them to listen for what it is as you sing the first line of the song (a plan). Show the game board, and compare playing it to following God’s plan to return to Him. Explain that this song teaches us about the plan and tells us how we can return to live with Heavenly Father. When we choose to follow his plan, we are blessed. When we make mistakes, there are consequences but the Lord always allows for repentance, again similar to this game. To play, one team will roll the die and move their marker. We'll sing the song to wherever they land. If they land on a colored square, they must choose the correct key word picture. If they choose correctly, I'll insert the image on the game board, they will then go up the ladder and we'll sing up to that point. If they choose incorrectly, they will go down the slide and only sing to that point. Once clip art is up, it remains up so if another team lands on a colored square already filled in with an image, they will simply go up the ladder. If a team will be passing over an empty colored square as part of their die roll (and did not land on a colored spot), the team cannot advance until they can insert the correct picture even though they will not be going up the ladder or down the slide. However, if they go up a ladder which leads them to surpass several blank colored squares, they do not need to fill those in. For Jr. I will modify it a little bit...with just the one game marker, everyone will just get a turn to roll the die. Whenever we pass over a colored spot, we'll stop and find the clip art that goes there. 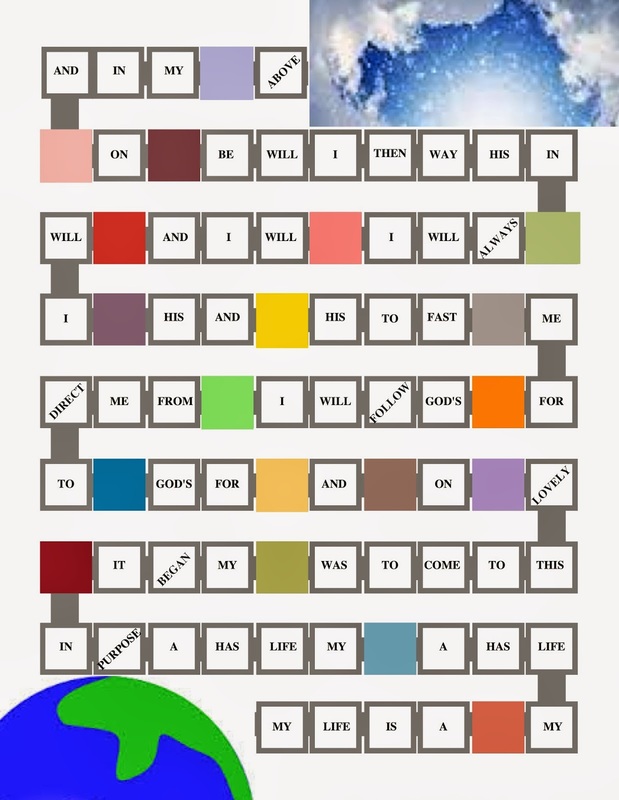 When we sing, we'll sing the key word clip art pictures with a little more gusto :). We'll only go up the ladders (maybe down the slides if they really can't figure it out) when we land on the actual colors. Who is our life a gift from? Why do we have this gift? How can we: work? pray? walk in his way? be happy? Where is my home above? Sr. Primary I will play against teams (probably only 2 teams, using 2 markers) and for Jr. we'll just play the game together, using only 1 marker. Okay, still with me? Kind of a lot of prep as I usually don't go to this amount of work - but I had an idea and ran with it. I hope it's fun! I'm planning on it taking 2 weeks to complete as we learn the song, teach the gospel, feel the spirit, all while keeping the little people engaged. Phew!! UPDATE: This was SO fun! I even had my Sr. Primary so involved. Everyone wanted to sing and listen for answers. We only got about half way through the game in both primaries so I'll be using it again to finish teaching. Thank-you! I figured it out! This is such a great idea, thank you for taking the time to put this all together and share it with us! For me, they played better in Windows Media Player than in Quicktime. I love it and made one last night. Thank you for so many wonderful ideas. I appreciate all the ideas you share with us. Thank you! Thank you! Im in Australia and was going to cost $20 in colour so i printed in B+W and used my craft inks to add the colour, thanks heaps for your ideas realy helps me and save me lots of time in ths very involved calling with 60 in our primay i have lots of children to teach. I'm so flattered that my little spot on the internet is reaching all the way to Australia! I'm glad to help!! Thank you for the nice comments! What a fun and fabulous idea! Thank you so much for sharing! Can't wait to use this. One quick question..how did you add the title to your game board? Hi Becca! When I printed it at Costco, it had a "title" option so I titled it "I Will Follow God's Plan" and picked a font. If you are printing this at home, it won't have a title. I hope that answers your question! Thanks again camille the kids loved this game and i will use it again durring the year to review the song. i also found this im going to try next week thought you might like it if you havent seen this link before. I belive the lesson topic is about the body in week 3 and this activity will be fun for this song. enjoy. I love this too! I also have a question - what do you do when they pass a colored square because of a ladder or large dice roll? Thanks! I played it two different ways. The first time I left the colored squares blank if we passed any. That way if we went down any slides and had to pass over the colored squares again, they were still blank. When we finished the game however, I noticed that not many colored squares were filled in. So when we played it the next time, we just filled any square in as we passed them. I hope that helps. Way cute! I think your hand drawn chutes and ladders are adorable! Do you ever have trouble with images not showing up right on google docs? I do, so for files with images in them, I now use box.com. I like that it shows me how many downloads for each document. I've just uploaded to Costco.com and they are warning me of a resolution issue. Is the grey version as large of a file as the black version? Thank you! Great idea. They are the exact same file, only I changed the color. I didn't get a resolution warning (at least I don't remember) and mine printed fine. I can directly email you the file if you want to try that. Just use the "Contact Me" tab above and I'll try to get it to you asap. Sorry you are having trouble. I printed this at Costco as a 20x30 as you suggested, but it isn't actually sized as a 20x30 and a bunch of it got cut off. What was your trick for printing it? Sorry you are having trouble - I updated the post so there are exact instructions on how I printed my poster at Costco. I am assuming you printed yours simply as a 20x30 PICTURE. Mine is a collage POSTER. I've also created and added a larger resolution picture (grey one only) to hopefully ensure it's not pixelated. I had a similar problem. I wasn't going to add a title, but decided I would play around with it. When I added the title, everything popped right into place for whatever reason. Just in case someone has the same problem, try adding a title. What did you resize the images to? Hi Jessica, it was originally sized as an 8.5 x 11 so I just doubled it to be 17 x 22. It didn't give me a resolution warning on costco's website once I did this. I followed your instructions and even though I still got the resolution warning, I took a deep breath, trusted what I'd been told, and ordered the print. Turned out great! The pictures of the earth and sky are somewhat pixelated, but the squares are all perfect. Thank you so much - really excited to give it a try tomorrow! I too followed the directions for collage and the poster came out awesome! I am so excited to see how my kids do tomorrow!! I love your ideas and suggestions...thank you for helping me fulfill my calling in such a fun and colorful way each week. I have followed your lesson plans for 7 weeks now as this is one of 3 callings I have and I could never keep up without your help...thank you!!!! Loved the idea, but I created my own poster... Are you okay my with having used your idea, but not using your poster? I should have asked before I just did my own thing with your idea. FYI the kids loved it! I seriously don't mind AT ALL! And you never have to use permission to tweak or change one of my ideas. I glean ideas from all over the place and cater them for my primary and my teaching style. My only goal is to help so whatever aids you, then go right on ahead! I'm glad the lesson plan worked well for your primary! That is so thoughtful of you to comment to ask, thank you!